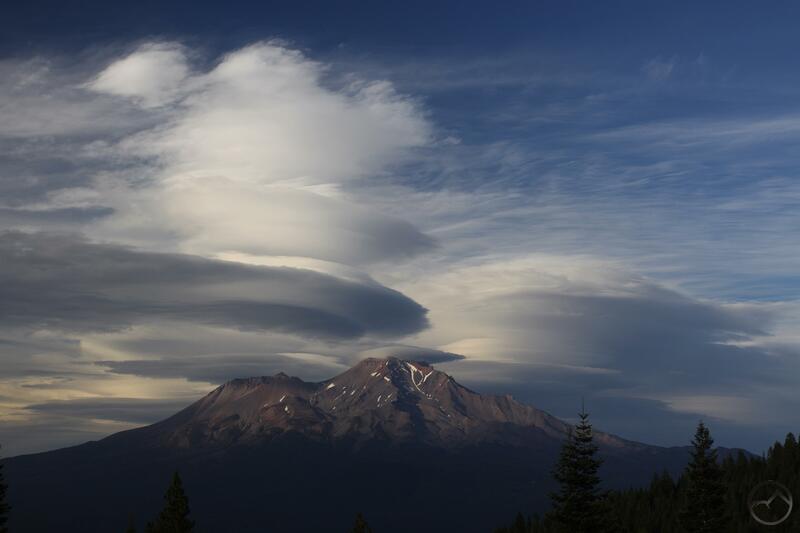 A massive, magnificent collection of lenticular clouds cluster around Mount Shasta. 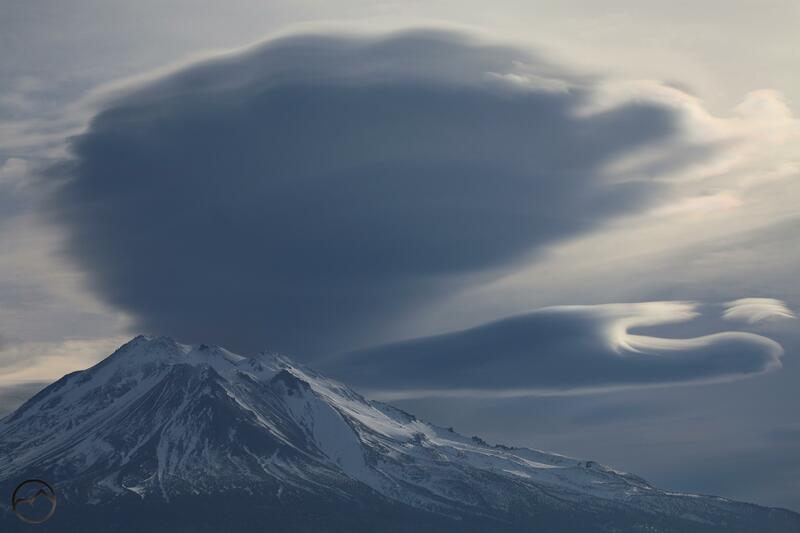 Since I launched Hike Mt Shasta more than 5 years ago, one of my greatest pleasures on this site has been the documentation of the lenticular clouds that have graced the mountain. I love them no matter their shape or size, each one adding its own distinct accent to Mount Shasta. However, each year there are a few lenticular events that are so overwhelmingly massive, so distinct in their construction or so perfect in their timing and the way they catch the alpenglow that they are set apart from the rest. In the last few years, when a notably impressive formation occurs, I have tended to devote special posts to them. These are among my favorite topics to write about. 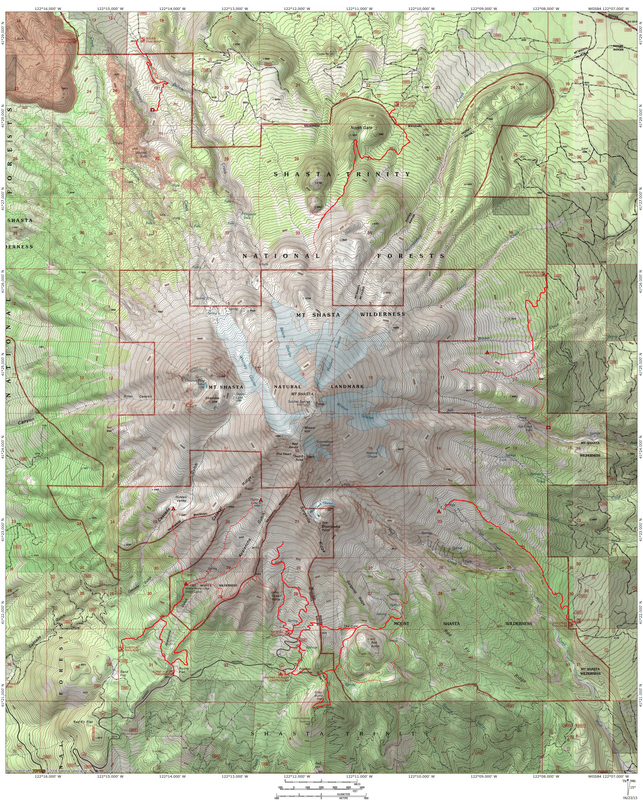 Naturally, this terrific event did not get a post here on Hike Mt Shasta, as the site was still 4 years in the future. However, this was a notable event for me, as it felt like I really was in Mount Shasta. Even though I had lived here for years by this point and even bought a house, being able to rush out and capture such a remarkable event was deeply satisfying and marked the beginning of quest that has continued since. This leads to the point of this post. I thought it might be interesting to collate all my posts one significant lenticulars and highlight the ones I thought were most spectacular, amazing and memorable. Hopefully I am not the only one who finds this interesting. This was a memorable event not just for the nice stack that hovered above the mountain but for all the other clouds that populated the surrounding sky. Like most of the best displays, this one was present all day long. 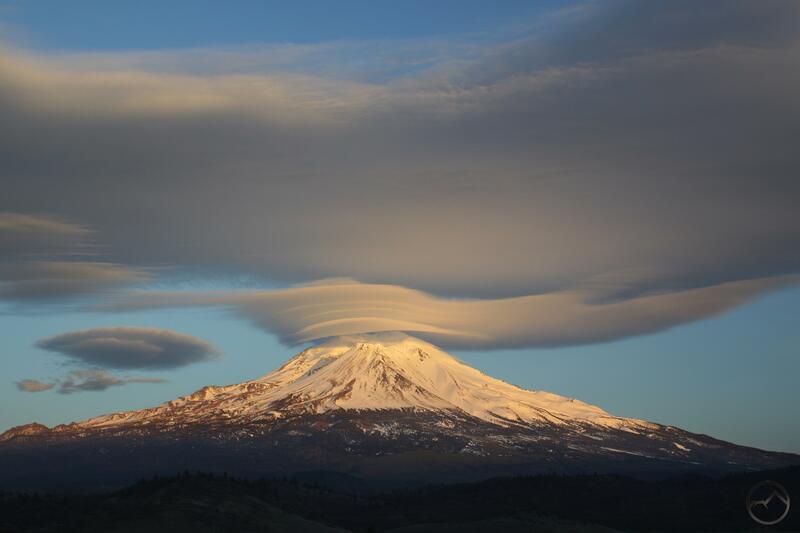 At times some of the other clouds looks like Chinese dragons dancing round Mount Shasta. It was a fantastical event that was also memorable because the pace at which the clouds changed was breathtaking. They actually seemed to be dancing as the shifted and morphed from one form to another. It was certainly one of the best displays of the year. Read more here. This display came unusually early in the year for something so massive. Normally these large lenticular events occur between October and April. This one came during the summer. It is odd to see the massive clouds built up above a mountain that has no snow on it. In spite of the summer conditions, this proved to be a particularly massive and beautiful arrangement. 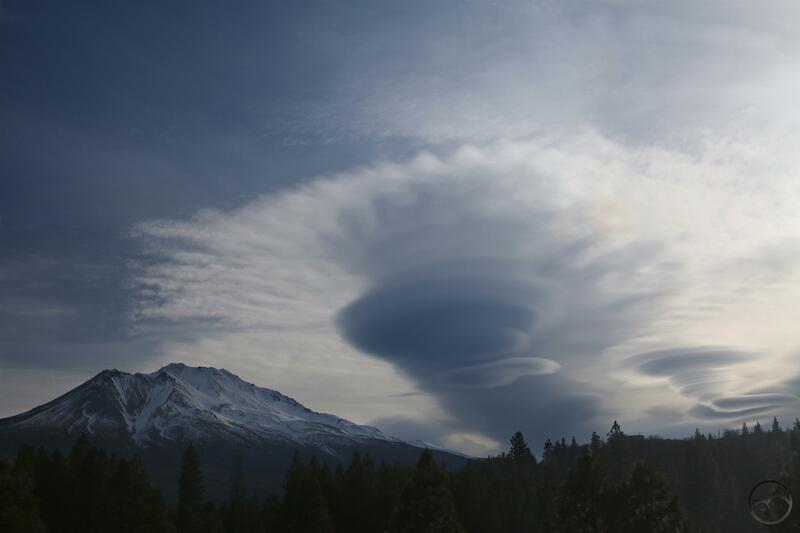 During the day the cloud consisted of a single, large, stratified disk hovering above Mount Shasta. I headed up toward Castle Lake to photograph the phenomenon. As the sun set the disk suddenly began to expand, split, and expand again. Eventually it formed a pair of lenticular towers, far exceeding anything I had anticipated. Read more here. This is one of my personal favorites. 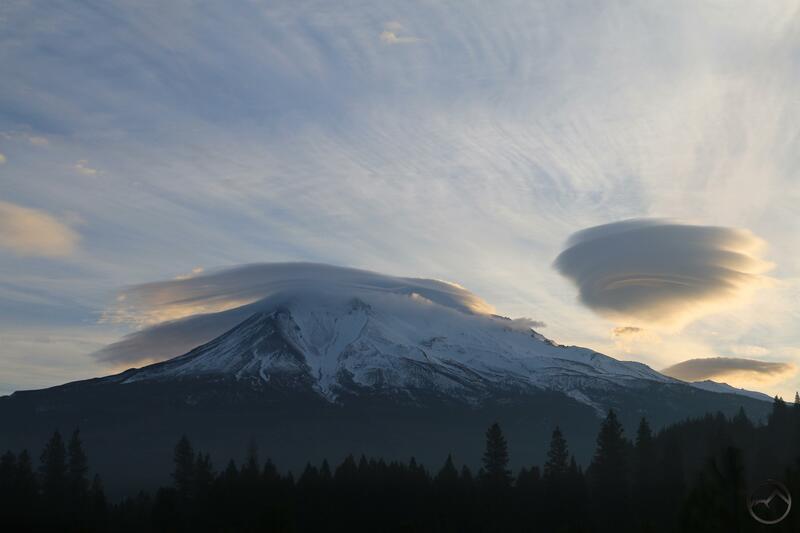 Even though the lenticulars lasted over Mount Shasta all day, it was their appearance in the morning that was so memorable. While there was a nice, wind-whipped disk over the mountain, the real highlight was a classic free-floating stack just to the south. As the sun came up, it turned them all gold. The spectacle was augmented by a high layer of clouds that spread out across the sky. These too were tinged gold by the rising sun. Of course, the clouds did last all day. Even though the sunset did not match the morning’s glory, it was still a display that has stuck with me since. Read more here. The day before Saint Patrick’s Day, Mount Shasta blessed us with an awe-inspiring showcase of the mountain’s great lenticular potential. On this day, there wasn’t much indication that a spectacular show was forthcoming. Nonetheless, as the afternoon began to transition to evening, formations began to manifest above the mountain. I headed north and witnessed a stunning set of lenticular clouds. There was a great stack right above the mountain as well as a fluctuating series of free-floating disks. 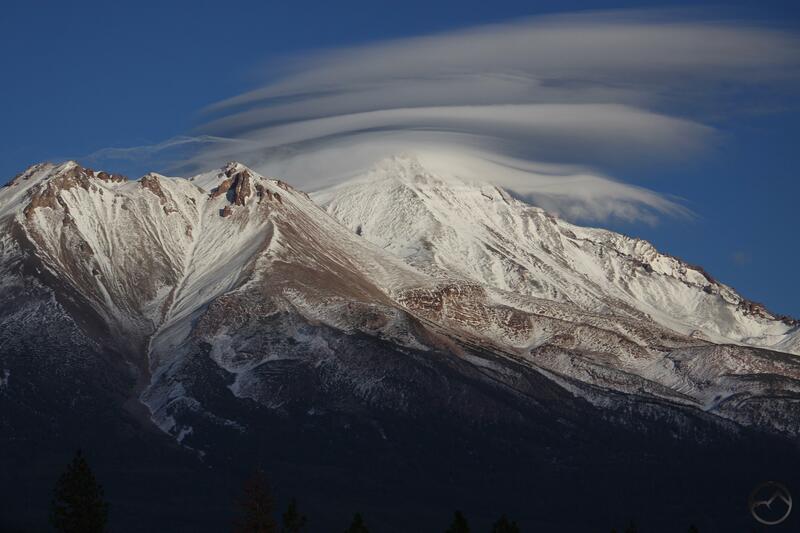 The really unusual part was the large cloud that seemed to blanket the sky above Mount Shasta. At times it was connected to the disks, at times it separated from them. Finally, at sunset, the whole formation turned pink with alpenglow. Does it get better? Read more here. Taken by itself, the lenticulars on this day were great, but not so overwhelmingly awesome as many of the aforementioned events. However, what made this one particularly great was that it started the day memorably, changed and morphed all day, then ended with an amazing sunset. Throughout the day it was a constant presence above the mountain but the morning and the evening were especially incredible. Taken as a whole, this was tough to beat. Read about the sunrise here. Read about the sunset here. Coming a little more than a week after another amazing event, this was quite possibly the single most spectacular and diverse lenticular display I have ever seen. In the morning, the clouds were possibly the most complex and massive formations I have seen above Mount Shasta. There were stack withing stacks, disks within disks and they were scattered all around the mountain. The rate at which the whole formation changed was astounding. The clouds took shapes I had never seen lenticulars assume. By midday it had contracted considerably but there was still a good-sized set of clouds over the mountain. In the evening the whole thing, which at one time had filled the entire sky, had been reduced to a single pennant, waving dramatically above Mount Shasta. While not the most impressive ending, it remained a singularly dynamic and beautiful day. Read more here. Thank you for these awe inspiring lenticular photos. We are looking forward to seeing these events ourselves, after finally moving here recently after many years of striving to live in Mt Shasta. We use your site almost daily. So cool to see all of these photos in one place! People who are not “photographers” do not like clouds on their images. While the clouds, they are often the ones who give “cachet” to the shots.